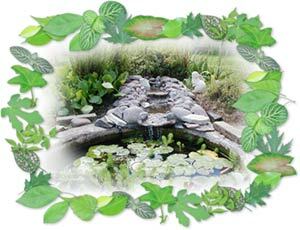 The cool, refreshing sounds of water bring a touch of the place paradise to your garden. There is a place for water in each of our gardens. Tiny puddles of water to attract birds and butterflies, waterfalls and large Koi and wildlife ponds each lend a special element to the landscape. We have over 10 display ponds to stimulate your creativity, books on water gardening and a bulletin board of pounds created by our customers. There is sure to be something to inspire each on our visitors.